The BNP broke party funding laws by failing to keep a proper record of who was giving it money, the Electoral Commission has ruled. But the watchdog said it was unable to punish the party as it lacked sufficient powers. The BNP was fined £1,000 for late submission of its 2008 accounts. The Commission then launched an investigation after it found the financial statement did not give a "true and fair view" of its affairs. It was concerned the party, which received £662,000 in donations during 2008, could be receiving money from impermissible donors. The BNP could not provide any information on 45 donors, who gave the party a total of £21,250, saying the details had been "irretrievably lost" when it transferred its manual records to a new computer system. The Commission also found 1,479 entries on a spreadsheet listing donor names and addresses but with no donation value. It said the party had breached party funding law by not keeping adequate financial records - but it was "frustrating" for the watchdog that it was not able to take any action because "there are no sanctions available to us in relation to this breach". Electoral Commission chief executive Peter Wardle said: "Political parties are required by law to keep accurate financial records, and this clear failure to do so is a serious matter. "It undermines the party's ability to demonstrate, and the Commission's ability to verify, that the party is complying with the law." He said the watchdog had been given beefed-up powers that would have allowed to take action if the offences had taken place after 1 December 2010. He said the Electoral Commission had written to the BNP setting out its concerns and planned to meet senior party officials as soon as possible "to ensure that their procedures for complying with the law are adequate" and they had taken steps to improve their procedures. 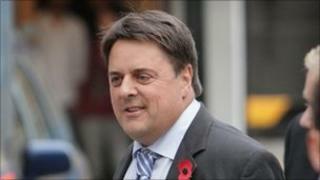 The BNP is facing financial difficulties following a series of expensive court cases, with leader Nick Griffin saying it has debts of around £250,000 and "very little money" in the bank. It is due to find out in the next few days if it has won a long-running court battle over its membership rules. The party voted to change its rules after facing a court injunction over its "whites only" membership. But the Equality and Human Rights Commission has argued the new rules were still "indirectly discriminatory". Mr Griffin has applied for the case to be thrown out.